Imagine if someone tells you that the single biggest thing you can do to improve your organisation’s performance in the next 12 months is to stand in front of the entire organisation and bare your soul: your vulnerabilities, your fears, the low points in your life as well as the highlights. And once you’ve done that, you have to get everyone else in the organisation to do the same thing. That’s the simple action that helped lead the Richmond Football Club from a horror AFL season in 2016, where they finished 13th, to an unlikely premiership in 2017. Even if you don’t like sport, please keep reading. This isn’t a sport story: it’s a business performance and leadership story. It started with a leader – in this case the Tigers’ senior coach, Damien Hardwick. After his team’s dismal performance in 2016, Hardwick looked back on that year and concluded that he was the team’s biggest problem. In the middle of that horror season, his wife had said to him that he was no longer the man she had married. The fun, happy-go-lucky Hardwick had vanished somewhere along the coaching path. He had forgotten the importance of relationships and instead had focused on data and process. ‘I’d turned into something that was not what I wanted to be’, said Hardwick1. He had no option but to change. The opening training session of the 2017 season saw Hardwick stand in front of the entire Richmond organisation and lay himself bare. The club’s captain, Trent Cotchin, went next, and the senior players did the same in the weeks that followed. Each of them told three stories: about a hero, a hardship and a highlight. These became known as Triple H sessions, and week after week throughout the season, every player stood in front of the group and took their turn. After the coach and captain, 23-year-old Brandon Ellis was the next to tell his story. He said his hero was his dad: ‘He was my right-hand man, who took me to training, never missed a session or a game, took me to the gym, kicked the footy with me in the pouring rain for however long I wanted, and so much more’ 2. When he was 16, Ellis came home from school with his brother and sister to find his mum and dad lying on the floor, crying. His dad, who had previously survived kidney cancer, had had lumps found in his throat. The doctors had told him the cancer was too far gone and couldn’t be cured. Ellis’ world crashed down. He stopped going to school and playing footy, so he could spend every minute with his dad. When Ellis’ dad went back to the doctors, they told him he could have treatment but it wouldn’t do him any good. His dad said, ‘Stuff that, I’m a fighter. I’m not giving up on my kids. Give me the treatment, I’ll do anything’. Ellis’ father said to him: ‘Whatever you do Brandon, go back and play footy. Do it for me’. Six months later, the lumps were gone, and he’s still alive today. Ellis said: ‘He taught me to never give up, always work my arse off … I play AFL for my dad’ 3. When Ellis finished his story, the group applauded and cheered. Some were crying. They gathered around him and hugged him. Incredibly strong bonds were being forged. And they got stronger as more players told their Triple H stories as the season progressed. When the 2017 Grand Final came around, Richmond faced the Adelaide Crows, the best team in the competition all season. Richmond hadn’t won a premiership for 37 years, the longest drought in the AFL, and were the sentimental favourites. Most experts picked Adelaide to win, as a comparison of the two teams’ lists showed Adelaide was superior in most aspects. But Richmond played an amazing game of team pressure and won the Grand Final comfortably. It’s an example of that old adage: ‘A champion team will beat a team of champions every time’. So if you want your organisation to be a champion team, think about the example set by Damien Hardwick. He found a huge performance-enhancing substance called stories – a near-zero-cost, near-zero-technology way to build connection, trust, team cohesion and team performance. 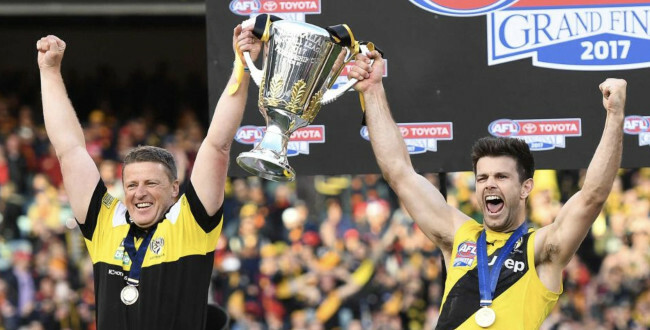 The Richmond players’ personal stories of heroes, hardships and highlights revealed the characters of those individuals and built the character of the team. Brandon Ellis summed it up well: ‘We don’t want to be fake. We want you to know, “This is who the **** I am”. We’ve taken a massive step forward this year in how much we care. We’re connected now. I feel like we’re forming a brotherhood’ 4. Just to put some science behind all this, research at Google in 2012 showed that psychological safety is the number-one predictor of which work teams perform best. At Richmond, the Triple H stories in effect created psychological safety. You can read more about psychological safety in a 2016 New York Times article by Charles Duhigg 5. 1 Nathan Schmook (2017), ‘Three words powering Richmond’, AFL Media, 30 September. 2 Konrad Marshall (2017), A Season with Richmond, Slattery Media Group, Melbourne, p. 284. This is a brilliant post and a great example of the power that true stories have, and even more so when someone bares their soul to a group of people. It shows courage and honesty and how sharing real life stories can have real life outcomes.